What to Do After a Dog Bite in a Wisconsin Park | Hupy and Abraham, S.C.
What should I do if I was hurt by a dog in a Wisconsin park? You should take action immediately to protect your physical and financial recoveries. You were not to blame for the accident, but if you fail to take action then you will have to pay for your own damages. Get medical attention. Dog bites injuries are painful and may quickly become serious. Dangerous, life-threatening infections can result and permanent scarring may occur. You can lessen these risks and get help for your pain by seeing a doctor as soon as possible. Report the accident to the local animal services office. The animal services, animal control, or other appropriate municipal office will notify the dog owner and take the required steps to investigate the dog bite accident. Learn more about your legal rights. Animal services will not protect your legal right to a recovery. Instead, you have to take action. You can learn more about how to do that by reading our free dog bite brochure. Wisconsin has a strict liability dog bite statute. That means that, in most cases, you have the right to recover damages from the dog owner or the dog owner’s insurer. You do not have to prove that the dog owner was negligent. It does not matter whether the city or county has rules that allow dogs to be off leash in certain parks. Instead, you just need to show that the person from whom you are attempting to recover damages owns a dog that hurt you. 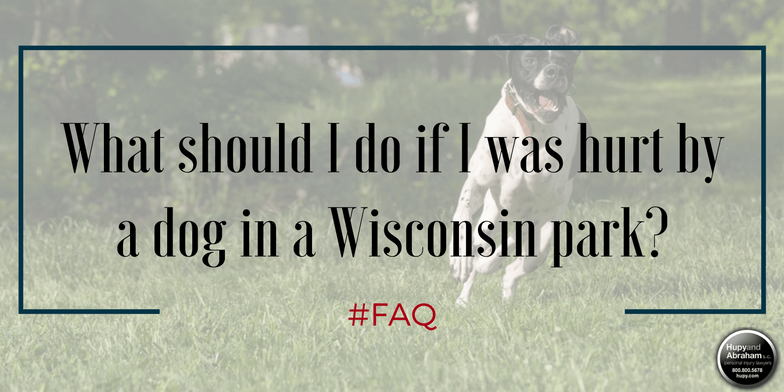 You should be able to enjoy the beautiful municipal and state parks throughout the state of Wisconsin without fear of being hurt by someone else’s dog. If you are hurt by a dog in a park, or if you suffer a dog bite anywhere in Wisconsin, then we encourage you to call us directly at 1-800-800-5678 to learn more about making a fair recovery.